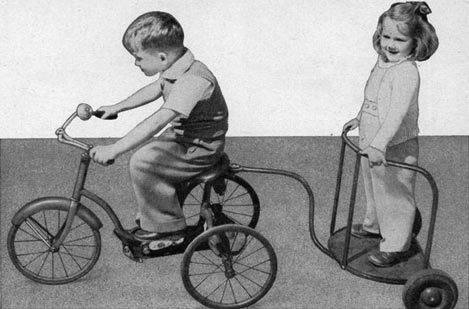 When I was in the third grade, I learned about this very cool thing called a bike-a-thon. I could take my bike and by just riding it help cure cystic fibrosis, a disease that I had no idea what it was, but sure sounded bad. In my idealistic eight year old mind this just seemed like it just having fun for a good cause, so I signed right up and went for it. My second grader sister heard about the same thing and decided she had to do it as well. That was a pain. This meant every pledge I went to get had to pledge equally to the both of us by royal decree of my mother. I was irritated, but we both pluckily canvassed the small town of under 1,000 inhabitants, all of whom knew our family, and gathered pledges. I knew no fear in those days, heck, I didn’t even realize knocking on doors asking for money is annoying in my innocence. Pledges were made per mile and so the first question we were asked was how many miles we were going to bike. I pulled the number twenty off the top of my head as it seemed a nice even number. I still remember some of the amused, patronizing smiles as these wordly wise adults then penciled in their donation. Our pledges piled up and we ran out of room to contain them, requiring extra pledge sheets. What’s the harm in donating to a couple of naive kids playing grown up biking on their Schwinn’s after all.
. The day of the riding came, and we proudly displayed our registration on our shirts and one gear bikes. We rode along, delighted in sandwiches, cookies and punch as we travelled far, far, beyond where our own foot power had ever taken us. We biked for the bulk of the day. As it progressed, the crowd of participants thinned out. The people manning the rest stations also thinned until it would just be a single person with a purple marker, with no more refreshments or other such niceties. We had a goal and we were determined to meet it and did not stop until hitting the twenty mile checkpoint as they were packing up for the day. This third grader, and his kid sister ended up tied for third place in amount of money collected, narrowly behind a couple of sixth graders. My teacher commented on how we would certainly have one if we had pooled out money, something that sounded fishy to me. We had to get it on our own, right? It is amazing to me now to see how unburdened and carefree I was about the enterprise because of what I didn’t know. I didn’t know people didn’t like people knocking on their doors asking for money for a good cause, looking all innocent. I didn’t know they built bigger and better bikes for riding that kind of distance. I didn’t know we were simply too small to be able to ride twenty miles. I didn’t know that anyone would ever think of pooling donations, have others work for them, or otherwise try to maximize their standing in prize rankings,as of course this was supposed to be an individual effort. Now, as a parent I find myself doing things for my kids out of habit, and taken back when I realize they should be able to do it themselves. I underestimate them because of my preconception what kids are supposed to be able to do, because of memories of the helpless infants I once held in my arms, and because it’s just easier and gets done quicker and right the first time. While present in any parent, this impulse is magnified intensely in the parents of children with chronic disease, or children who had life threatening encounters with health issues as babies. This leads to what is known as the vulnerable child syndrome. The parents are traumatized by the experience and reflexively grow very determined to protect their child from any possible harm that could ever come their way. Parents of vulnerable children have difficulty being apart from the child. They frequently overindulge the child. they are too often overprotective. The child often does not receive appropriate discipline; with some parents even tolerating physical abuse from the vulnerable child. In the end, these children react to the perception that they are in fact, vulnerable. They live down to the expectation. They are more likely to suffer from depression or anxiety, or other mental illness. They also suffer more physical illness as well in yet another example of the mind-body connection. They are personified in the character Colin, in the childrens’ book,The Secret Garden. In the case of disability this tendency is reinforced by our own culture. Of course disabled children can’t do what normal children do, society tells them. Of course they won’t be independent. Why discipline them when their lot in life is so hard, and time so short. These children never learn how to manage money, how to do chores, how to save for what they want. They never learn to apply themselves in school. Their just biding time to obey the law, after all, the culture supposes. They never plan for a life the way other children do. They remain helpless. These children never learn the skills necessary to manage their own health. Actually healthy children never learn to manage their own health either but that is a subject for another day. The parental fear that underlies this phenomenon is perfectly natural and I would never blame a parent for having them. However, the stunting of their child’s development is also real. So what can be done? Might I suggest using the power of why not. Parents need to learn to examine if a door to see if it really needs to be shut on their child before they close it. If the child expresses a dream when they grow up, ask yourself “why not” before discouraging it. The amazing thing is that with a little imagination and creativity, most the answers to why not can also be addressed. Make sure the why not is a definitively impossible why not. Otherwise, if they are of an age you would have them do chores, give them chores. If they do something wrong, let them know. If they want a part time job, let them look for a part time job. If they talk about marriage or parenthood down the line, don’t assume it could never happen without a definitive reason why not.. Will they go through hurt and disappointment at times? Absolutely. We all do. It is part of living a life. They will also gain the tools they need to succeed in the process. Always ask yourself if they really need to be treated differently than any other child in any given situation as a check to the unconscious hold your fears may have. All people, even children with chronic conditions, are capable of much more than we typically want to give them credit for. In general, It is safer to assume they can do more rather than less. Just ask an eight year old small town kid who decided to take on Cystic Fibrosis by taking names and riding a bike. He’s now practicing medicine somewhere in these United States and loving it.